Residents across five Midwestern states are buzzing about the roaring fireball that lit up the sky last night. Space aces say it was most likely a meteor but could have been rocket debris or a chunk from an asteroid that whizzed between Earth and the moon this week. 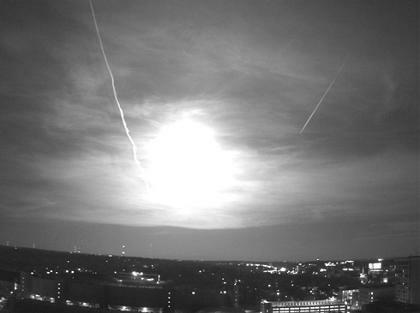 The spectacle was reported in Missouri, Iowa, Wisconsin, Illinois and Indiana just after 10 p.m. CT.
A black-and-white roof-cam on the Atmospheric and Oceanic Sciences Building on the University of Wisconsin-Madison campus caught the burst (photo). Watch the loop. An amateur astronomer from Waunakee, Wis., told Madison.com he was in his kitchen when he thought a bolt of lightning hit. "My first reaction was, 'Gee, when do the clouds roll in?' " Mark Weller said. He looked out the window "to see whatever it was disintegrate into half-dozen or a dozen parts all screaming across the sky." Meteors are common occurrences, the result of Earth passing through comet debris. Last night's probably was part of the Gamma Virginids shower. It began April 4, and peak activity was last night and today. Most don't produce the kind of spectacle seen last night. "Even something relatively small, like the size of a golf ball, will light up the sky when it comes through," said University of Wisconsin Space Place Director James Lattis. "They tend to disintegrate completely while they're still many miles above the earth." Six other showers are in store for the rest of the year, including the Lyrids the night of April 21.